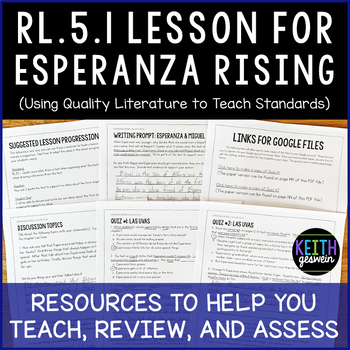 This product contains several resources to help you teach, review, or assess RL.5.1 using the first chapter of Esperanza Rising. Your students will need to read the first chapter of Esperanza Rising in order to use this resource. RL.5.1 says students should, "Quote accurately from a text when explaining what the text says explicitly and when drawing inferences from the text." 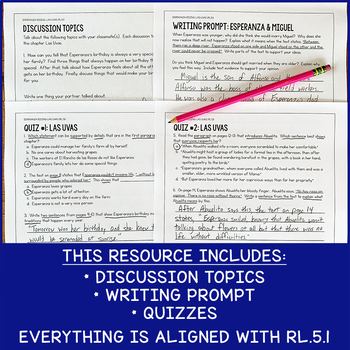 Suggestions about how you can use these resources to teach an engaging lesson on RL.5.1. This 4-page document explains how to use each resource. Two discussion topics for the first chapter of Esperanza Rising. Your students can discuss these with a partner or you can talk about them as a whole class. Both topics are aligned with RL.5.1. Students will have to make inferences and support them with evidence when writing about two of the story's main characters. The prompt aligns with RL.5.1. Each quiz contains 3 multiple-choice questions and 1 written-response question over the first chapter of Esperanza Rising. All questions align with RL.5.1. Questions are written to meet the rigor of the standard while not confusing students. 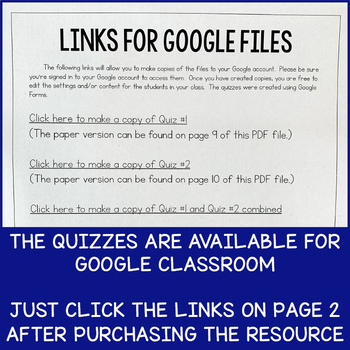 In addition to these paper resources, the quizzes are also available for Google Classroom. The self-grading quizzes were created using Google Forms. Clicking the links on page 2 of this file will allow you to make copies to your Google Drive. You can then edit the quiz questions if you need to. You must have a Google Classroom account to utilize this. Otherwise, just print the quizzes on paper. 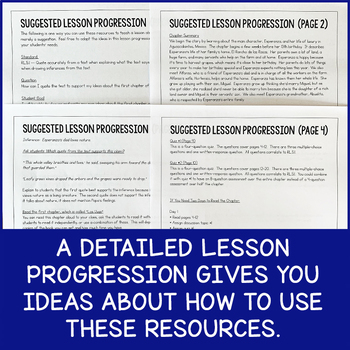 You may also be interested in my lesson units for fifth-grade RI standards. Click here to browse my resources for all 10 RI standards.